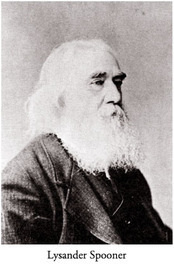 Lysander Spooner was an American individualist anarchist, entrepreneur, political philosopher, abolitionist, supporter of the labor movement, and legal theorist of the nineteenth century. He is also known for competing with the U.S. Post Office with his American Letter Mail Company, which was forced out of business by the United States government. He has been identified by some contemporary writers as an anarcho-capitalist,while at least one writer is convinced that his advocacy of self-employment over working for an employer for wages qualifies him as an anti-capitalist or a socialist, notwithstanding his support for private ownership of the means of production and a free-market economy. Natural Law, Or, the Science of Justice: A Treatise on Natural Law, Natural Justice, Natural Rights, Natural Liberty, and Natural Society: Showing That All Legislation Whatsoever Is an Absurdity, a Usurpation, and a Crime.